Circa 1830. Rich in the legacy of the Civil War era, this historic Greek Revival country inn was built in 1830 and has been restored with modern conveniences. The Hallauer House Bed & Breakfast spans two acres in Oberlin, Ohio with fish ponds, fire pits, streams and delightful pathways to enchanted garden rooms. 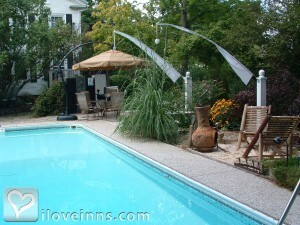 Swim in the heated in-ground pool surrounded by lush landscape. Totally relax in the Asian Spa that features a sauna and Jacuzzi tub with candles and music to accent the peaceful ambiance. Sit and play one of the many instruments by the wood-burning stove in the Music Room. 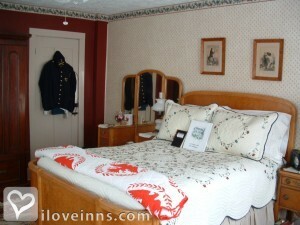 Amenity-filled guest bedrooms and a suite are named after the specific divisions of the Civil War. Savor a three-course breakfast each morning. Packages and specials are often available. This property has 3 total guest accommodations, 2 with private bath, 1 two-bedroom suite. 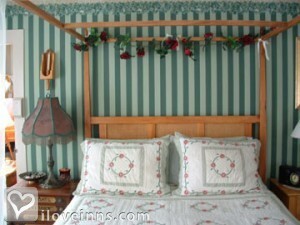 The types of beds available include Double, Twin and Queen. Romance surrounds in the heated pool, outdoor hot tub, secluded pavilion by running stream, indoor Asian Spa, and four course breakfast. We have a extensive compost for the garden. We use non toxic cleaning supplies, have gold star appliances, ask guests to reuse towels, use on wall soap dispenser to name a few. Located here is what we like to call "The Garden of Misfit Junk." Here you will find many re purposed items that bring a garden to life. There is a cascading stream that empties into a small pond, garden rooms, windows, doors, mirrors, unique pots of flowers, interesting statues, and the Soundscapes Garden full of musical instruments. Not suitable for children under age 13. •	A full refund to your credit card will be made for cancellations made 15 days or more before stay is to begin. •	If cancellations are made 7 to 15 days before stay is to begin, you will receive a refund of 50% of your entire stay unless we are able to reserve the room with someone else for the entire stay that you reserved. If the room is rebooked, you will receive a full refund less a rebooking fee of $25.00. •	If cancellations are made less than 7 days before stay is to begin, the nights not used are not refunded. If you arrive and decide not to stay or leave early or you do not show up, the nights not spent are not refunded. A hidden crawl space, with cut out hole in floor above and a dry cistern indicate that this 1830 house was very likely on the Underground Railroad. Also there are many artifacts from the Civil War and historical books about US history from Civil War to present day. Certificate of Excellence for 2017 and 2018 from TripAdvisor, 2010 and 2012 Runner up for best B & B in Ohio and Runner up for Most Unique B & B in Ohio from the Ohio Hotel and Lodging Association. Oberlin College, Lorain County Community College, Baldwin Wallace College, Cleveland State Univ, Ashland Unniversity. Joe and Susan are excellent hosts and their breakfasts are delicious every time! The rooms are beautiful and comfortable. I proposed to my fianc�e beside their pool. Susan's gardens are beautiful and original. Joe and Susan do their part to reduce their impact on the environment, and encourage their guests to do the same, which we really appreciated. We are just poor college students but we can still manage to pay for a couple-day stay. I wish we could afford to stay longer, but we stayed there for the second time this past weekend, and we intend to make it an annual get-away. Four thumbs way up from us! We spent 5 consecutive nights in various BNBs in North Ohio. This one was by far our favorite! "Attention to details" is an understatement. I can't say what amazed me more - the fascinating artifacts and decor, the beautiful garden, the extra amenities(wifi, stocked fridge, pool, etc. ), the lovely music room or the OVER THE TOP breakfasts. OK, being a foodie, the breakfast was definitely my favorite part. Exquisite table settings and wide variety of hot tea options was a treat. I loved the egg and cheese quiche we had on the first morning, served on an elegant bed of fresh spinach. The puffed pancakes with fresh peaches and blueberries was one of the most beautiful presentations I have ever seen - and it tasted even better. I could go on and on... Susan and Joe are the ultimate hosts, not only willing to share their knowledge and expertise, but also very interested in getting to know us. If we should chance again on a visit to Ohio, we would definitely make a special point to visit Hallauer House again. Great breakfasts, terrific service. The owners are very welcoming and friendly. 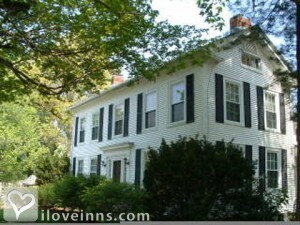 The pre-Civil War house has modern baths, TV in rooms, wireless internet, and lots of antique furnishings. Though other B&Bs are closer to Oberlin College, this is the best I've stayed in. We thoroughly enjoyed our stay. One of the nicest bed and breakfasts we've ever stayed in, and we have stayed at many. Beautiful rooms with very comfortable bed and spacious bathroom. Delicious and filling breakfast - every detail was lovely. Hosts were gracious and accommodating. I hope my daughter gets into Oberlin and that we can stay again and again! My sister and brothers and I have stayed here for a family reunion for the past two summers. This is an exceptional place with personable hosts and outstanding two course gourmet breakfasts served alternately on red or cobalt blue glass service. Joe and Susan served breakfast each day and offered information on the town and joined in the conversation. On the third day we had the opportunity to use the pool. Our hosts joined us with a glass of wine which added to our enjoyment of the stay. The amenities were outstanding. Our hosts were attentive and thoughtful I left my travel pillow in the suite when we left. Joe called me enroute and got my address. It arrived home soon after I did. How great is that!